Indeterminate. Regular leaf. 85 days. Wispy vines like most heart types, production was amazing. We always have loved the oxhearts and find them superior to paste types. This is must have for anyone who finds these types hard to grow. Indeterminate. Regular leaf. 85 days. Wispy vines like most heart types, production was amazing. We always have loved the oxhearts and find them superior to paste types. This is must have for anyone who finds these types hard to grow. 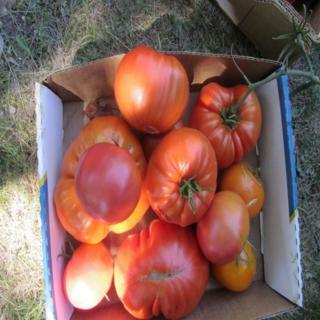 Very large tomato and the best part is the delcious fruits that can be eaten fresh as well as cooked.